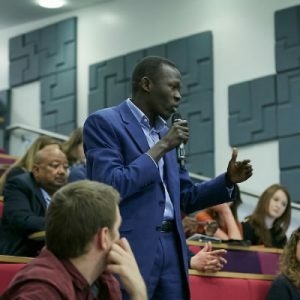 We run events throughout the year, directed at a variety of audiences – from the Sudanese community to decision-makers, with the aim of raising awareness about human rights abuses in Sudan and the plight of those who make it to the UK. We also ourselves attend events and conferences on Sudan or relevant topics, providing a strong showing of support to counteract the sometimes dangerous denials of Sudanese Embassy officials who attend. Certain events we run have now gained an annual billing due to their popularity. One of these is the Play2Remember London football tournament we run alongside Football for Hope, Peace and Unity, a group we collaborate with on atrocity prevention. This brings together survivors of genocide and mass atrocities, as well as those who work to support them, in a spirit of hope, reconciliation and integration through sport. The event usually coincides with the International Day of Sport for Development and Peace, as well as falling during April, which is the month of Genocide Awareness & Prevention.